Have you taken a look around your entire property recently? Odds are, you probably have some useless, metal objects lying around somewhere. The key is in finding them. Generally, people have scrap metal objects sitting in one or more of the following places on their properties. Somewhere in the deep recesses of your kitchen cupboards, you’re bound to have a few old, metal objects that you haven’t used in years. Maybe you have old silverware? Perhaps you have a broken appliance? If you scour your kitchen for a long enough time, you’re almost guaranteed to find something that can be recycled. If your home has a finished basement, it may not house any metal items that you’d like to recycle. However, if you use your basement primarily for storage purposes, it’s possible that you have a number of non-functioning metal objects down there. Old TVs, VCRs, DVD players, exercise equipment, picture frames, and a variety of other metal materials could potentially be found in your basement. It’s like a treasure trove just waiting to be discovered. If there’s any one place on your property that houses unused, metal objects, it’s probably your shed. Isn’t that what sheds are for in the first place; to store all of the stuff that you rarely have a need to use? You never know what you’re going to find in your shed. Maybe you’ll find an old bike? Perhaps you’ll find some unneeded gardening equipment? The possibilities are endless. If you are someone who keeps the exterior of your house looking tidy, it’s somewhat unlikely that your patio contains any metal objects that you’ll want to recycle. However, if you use your patio as a makeshift storage area for formerly-used possessions, it likely contains such objects. You might find a number of different things on your patio, from bikes, to sporting equipment, to gardening equipment, and more. These objects can almost always be recycled. Regardless of whether you spend a lot of time in your garage, or simply use it for storage purposes, it’s bound to contain at least some old metal objects. Metal objects that are commonly found in garages include car components, fencing materials, tools, and more. All of these objects can be melted down and transformed into other metal objects. How often do you clean out the closets in your home? If you’re like most people, you probably don’t do so very often. Therefore, there’s a good chance that your closets contain metal objects that you no longer need. Instead of letting these objects continue to take up valuable storage space, why don’t you trade them into a recycling company and make a bit of money? You’ll essentially be killing two birds with one stone. For some people, the attic serves as your home’s personal junkyard. You almost undoubtedly have old, useless, metal objects lying around in the upper portion of your home, all of which are probably capable of being recycled. Holiday decorations, sporting equipment, garden tools, and a variety of other items are often found in attics. By clearing out your attic, there could be some money in it for you. Are you looking to recycle metal in Chicago? If so, we here at Central Metal Recycling have you covered. 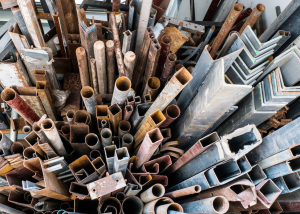 We recycle metals of all kinds, including brass, copper, steel, aluminum, e-scrap, and more. Not only will we come to you and take this metal off of your hands, we will pay you for the privilege. Contact us right now to chat!